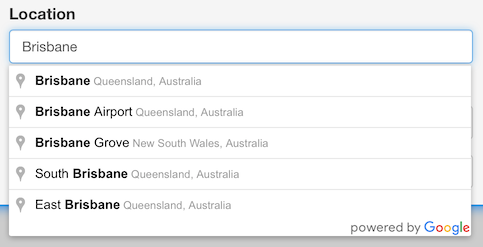 Google Places Autocomplete is an excellent addition to a web application that needs to have its users enter a location. I've been using this API quite a bit on my travelblog.ws project and have written about ways of implementing it with jQuery. This article shows how I am passing around the latitude/longitude coordinates that Autocomplete returns so that I can make use of them in other parts of my code. The issue I was trying so solve was that I needed geographic coordinates for a Place. The Places API of course lets you look this up, but that's a separate query and hence another round-trip to Google's servers. It turns out that when you get a Place via Autocomplete, it already has these coordinates. So instead of looking them up later all I had to do was store them somewhere. The trick to getting hold of this data was adding an event listener for the 'place_changed' event and then storing it as user data into the input element that has Autocomplete enabled. The code is more or less the same as what I've shared in my previous article, with a few additions. On line 11 I create a reference back to the input element for which I am adding Autocomplete for. This is required to store the user data inside the listener. Lines 14-18 have the event listener. This code gets the coordinates of the Place and adds them to the original input element's data attributes.